I <3 this idea so much. I first heard of it through some “tips and tricks” clip I watched online. I saw it several months back and the suggestion was really was more related to school aged kids, so I stashed it away at the back of my head as a cool trick I could try some day in the future. Enter preschool. Enter busy mornings. Enter a mad dash to get C to school on time. I’ve embraced this idea sooner than I thought necessary. 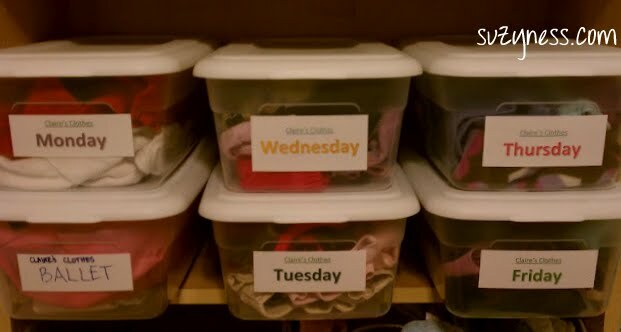 The basic idea is this – create boxes for each day of the week (C’s stuff is small, so I used shoe boxes I found at walmart for $1). Inside, prep the clothes you’ll need for the day. I have pants, a long sleeve shirt, a short sleeve shirt, socks and a sweater in each box. I prep the boxes when I’m putting away C’s laundry, as that makes it really simple to find coordinating outfits. Then, on the morning in question, pull the box, throw on the clothes, and get out the door in record time. It’s fantastic. I even put together a box for her ballet stuff. Mostly, it’s great to 1) have a place to throw the misc ballet items I come across during the week and 2) know exactly where everything is the morning of ballet practice. I’m amazed at how much time savings this really equates to. I, like most moms, like to coordinate C’s clothes. Or at least not have them completely clash. Here’s a recount of our usual pre-boxed clothing morning. Find red pants… scour the shirt drawer to find a shirt that’s neutral or has red in it. Avoid pink, blue, purple. Nothing? Ok, new approach. Find a shirt I like, then try to find pants that match. Settle on jeans. Put shirt on, pull jeans on, only to discover they are so incredibly large on C that they fall down when she tries to walk around. Find another pair of pants… realize it clashes with the shirt… seek out another shirt. After about 4 outfit changes, we finally find something suitable and are able to move forward with our day. Find socks. No matching socks? At this point, I just don’t care. We’re both frustrated and ready to let C run around in her diaper. After starting this process several weeks ago, I didn’t prep the boxes last week, and most mornings went something like that. Chaotic. Frustrating. Lots of wasted time. I’m so in love with this idea.